Need advice about a specific Ford Mustang problem? 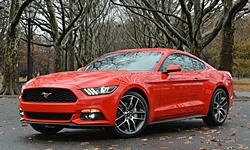 See TSBs and recalls for the 2015 Ford Mustang. See repairs for all Ford Mustang model years. 16500 mi rear back-up camera stopped working. dealer replaced the camera module. Jun 2017 Rubber door trim driver side. 19000 mi Passenger window glass shattered when closing the door. Factory did not install window inside the rubber gasket, causing it the metal bracket to crack and shatter the glass. 29000 mi Backup Camera was failing. Needs software reflash. US $60 Lugnuts were swollen and could not be easily removed. US $1100 Installation of tire pressure monitor sensors on wheels for winter tires, cost $550 / four sensors. 7300 mi Drivers seat back rest had a squeak, replaced drivers seat under warranty. 5500 mi Compressor clutch locked in and over pressured the system. Clutch was replaced under warranty. 5600 mi Hot/Cold flapper malfunction. It would blow hot air only on the driver. Entire HVAC system in dash was replaced (flappers, heater core and evaporator). 15000 mi Garage door buttons built into the sunvisor stopped working. Entire sunvisor and button assembly had to be replaced. 34000 mi The HomeLink garage door buttons in the sun-visor stopped working. This is the second time the visor/buttons unit has been replaced under warranty for the exact same problem. 35000 mi Seat heater quit working. Reprogrammed computer. US $2 Shifter pull up collar that allows shifting into reverse broke and needed to be replaced. Mustang puddle light on driver's side clip failed. 27000 mi Passenger side window switch and door electrics were replaced. The passenger side window would not fully go up. 12000 mi A/C Condenser Core Went out approx. a year into ownership around 12-13k miles. 26000 mi Right-hand side passenger puddle light showed signs of distorted image. Part was replaced. US $80 Small tear is driver side left seat bolster was patched with a vinyl repair. Tear returned eight days later. US $125 Re-patch vinyl leather seat bolster. 9100 mi Drivers seat loose. Seat track replaced Back up camera inoperative. Camera replaced. 20500 mi Front brakes speaking. Rotors and pads replaced under warranty. 11000 mi Transmission was leaking fluid. Dealer couldn't determine if it was a single issue: Torque Converter, Pump, and all seals replaced. 32000 mi Transmission leaking again. Dealer removed transmission, replace the Torque Converter, Seals, Pump, and cleaned the valve body. CV boot clearly leaking fluid. Dealer replace entire axle on Driver's side rear. 37000 mi Rattle in dash, not fixed. 8900 mi Having problems adding gas. Nozzle keeps popping out and you have to keep adjusting it constantly to get gas in. They said nothing was wrong with it. It's very irritating though. 14000 mi Side mirror driver side defective. Sometimes when I press my setting after getting into the car the side mirror motor seems to be stuck or it fails to move the mirror assembly into the correct position for me. I even showed them a video of when it was happening ... They couldn't replicate during my visit. 18000 mi Side mirrors not working consistently when reset by seat position for second driver. 5000 mi Broken exhaust baffle. Repaired under warranty. 18600 mi Adjust Convertable top. Replace broken good latch. US $150 Replace mass air sensor. Replace hose to air filter. Problem caused by incorrect installation of an aftermarket cold air intake by me. 16000 mi Cruise control intermittently quit and steering wheel controls for cruise control would not respond for several minutes. Same controls controlled DIC functions would also fail to respond. Dealer replaced steering wheel control modules and did not fix the issue. Dealer then replace the control module relay which fixed the problem. 8060 mi Check engine light. Gas vapour leak. Reset light, problem with capless fuel filler flap. Has given messages before, but, seems to be ok now. 8160 mi Sync II system would not play audio(music) from smartphone. Factory reset did not rectify problem. Had to disconnect/connect battery, re sync phone to fix. I have Sync I in other vehicle, they both are horrible, understand why Ford discontinued! 32000 mi Frameless windows have a feature that drops them a couple mm when you pull to open the door to clear the top of the car. Driver's side started randomly moving up and down while driving the car. Drivers side window motor was replaced. 33900 mi Loud grinding noise and vibration at low speeds. Dealership found washer improperly installed in rear differential, and rebuilt the differential. A loud humming noise at highway speeds. Not fixed. See our lemon odds and nada odds page to see vehicles with no repairs or vehicles with more than three repairs. To see how frequently 2015 Ford Mustang problems occur, check out our car reliability stats.